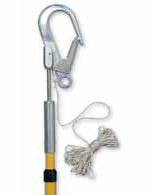 Anchor Grips are portable, reusable anchorage connectors designed for use in concrete applications. Can be removed and re-installed into a new location. Insertion is into a properly sized, cured concrete hole. Designed for vertical or overhead/ceiling surface applications. Made of stainless steel, aluminium and non corrosive materials. 496 suits single user connection. 497 suits dual user when used with a horizontal lifeline system. Designed for use on 'I' beams, providing either a fixed or trailing anchorage point for workers. Adjustable to suit the width of a beam from 76mm to 355mm. 8816-14 is designed to trail hands-free behind a worker. 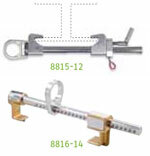 8815-12 is to be clamped in a stationary position onto the beam. Used to hook personal protective equipment to a structure. Tong opening style anchorage connector. Suitable for one person anchorage 15kN. Medium size to suit a structure up to 75mm in diameter. Large size to suit a structure up to 100mm in diameter. Complete with grade 9 nut and lock washer. Maximum tensile strength of 22kN. Clearance hole for 1 bolt. 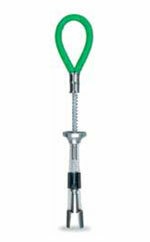 The Extender hook allows the user to attach to a secure anchorage point overhead at any height of up to 7.5m. Lightweight fiberglass telescopic pole (2.6m retracted). Aluminium hook with 63mm throat opening. Use in conjunction with an anchorage line as a first man up system. Ideal for riggers, linesmen and tower workers. 1m anchorage strap with dee ring one end and reversed eye other. Protective sleeve prevents wear on webbing. Easy attachment to dee ring by lanyard or anchorage line. 6mm plastic coated galvanised wire. Thimble eyes at each end. Suited for use over sharp edges or in welding environments. 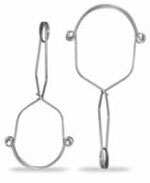 Anchorage strap with large and small alloy dee each end. Chokes through itself around a suitable anchorage point. Provides easy attachment of lanyard via small alloy dee ring. For single person use only.